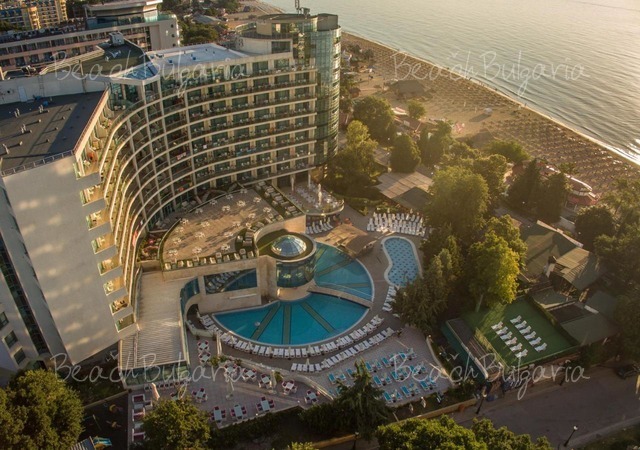 Serena Residence Hotel complex is situated on a hill, in the Mapi area, 350 m from the Kavatsi beach and 3 km from the center of Sozopol resort. Serena Residence complex features 17 luxury studios and 75 one-bedroom apartments with balconies and individual air-conditioning system. The studio includes one room with two beds, armchair or sofa-bed. Bathroom with shower and toilet. Maximum capacity - 3 pax. 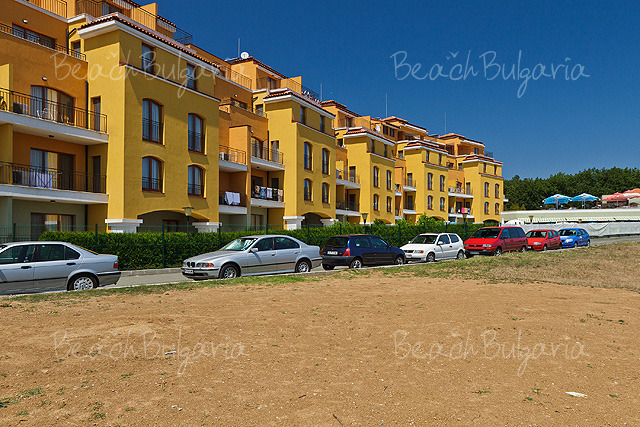 The apartments offer one or two bedrooms and a living room with sofa-bed, armchair and kitchen equipment. Bathroom with shower cabin or bath-tub and toilet. Maximum capacity - 4 or 6 pax. Satellite TV, fully equipped kitchenette (electric cooker with rings, fridge, absorbent, sink, etc. 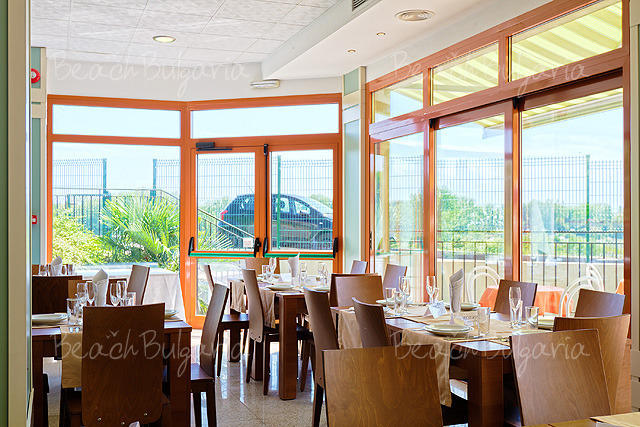 ), dining table with chairs, safety deposit box /in some rooms/, air conditioning, TV, hair dryer, balcony. Maid service - every day. Change of household linens - every 3 days. 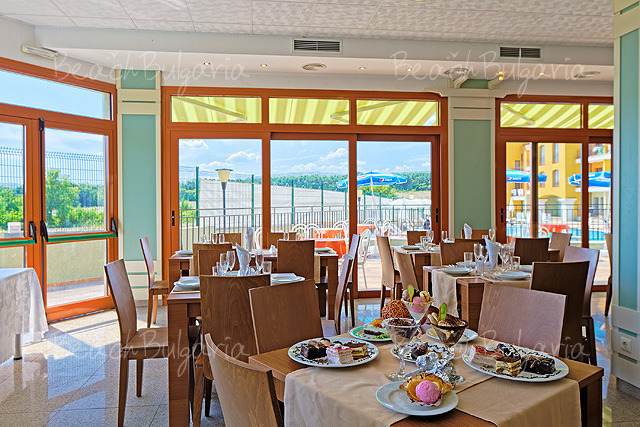 Main restaurant with terrace near the pool offers menu à la carte, rich and varied buffet with contemporary Bulgarian and international cuisine, as well as indoor and near the outdoor pool. At guests disposal is pool bar, as well. 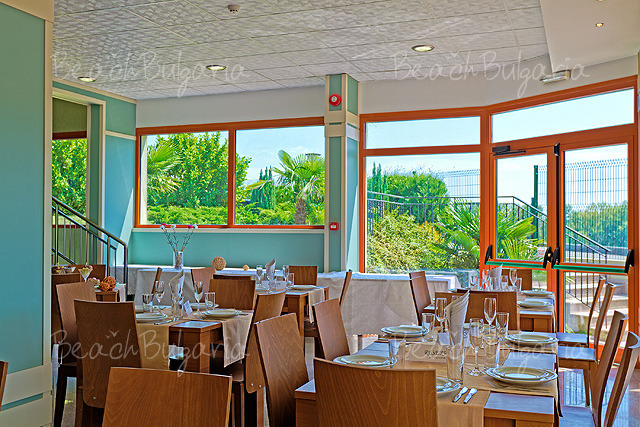 The hotel offers All Inclusive accommodation. 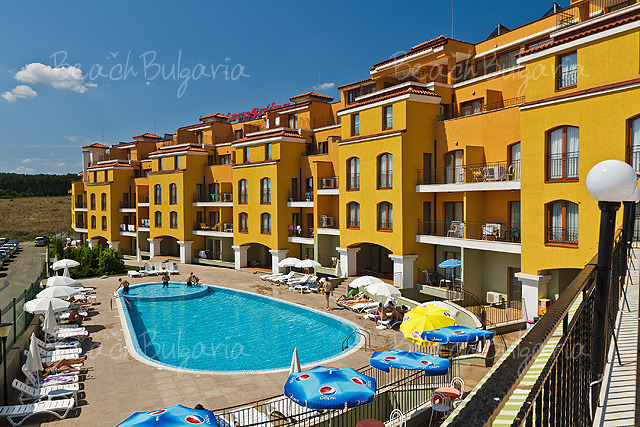 The complex offers an outdoor swimming pool with children's section, parasols and sunbeds near the swimming pool. The sport and wellness center offers massages, fitness centre, a variety of cosmetic procedures, archery, table tennis, billiard, professional animation, sports field. Children’s club offers entertainment for children under the care of professional animators. 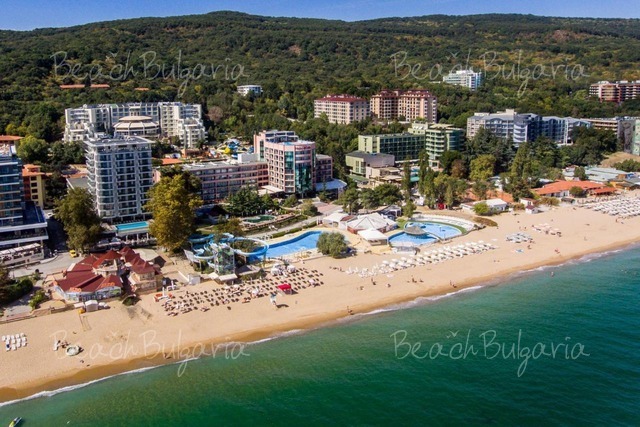 The hotel offers shuttle bus to the beach (twice a day). You can choose between 2 modern equipped rooms with everything necessary for seminars, presentations and team building. Maximum capacity - 80 persons. 4 types of raw nuts; dried fruit. Vegetarian dishes: stewed and roasted vegetables. Garnitures: sautéed potatoes, boiled potatoes, mashed potatoes, steamed rice, steamed vegetables, hot and cold sauces, spices. 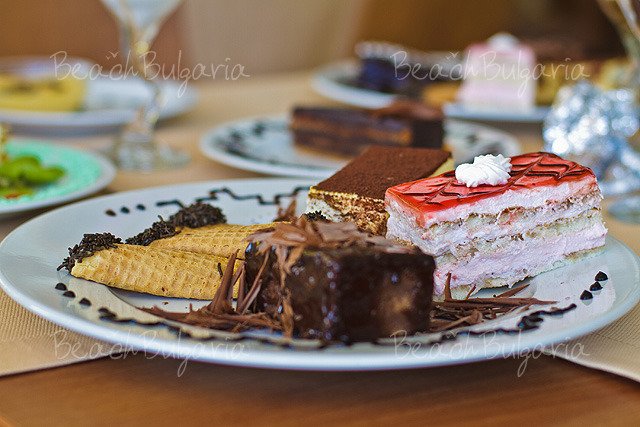 Desserts: cupcakes, tolumbichki, baklava, creams, fruit yogurt, compotes, seasonal fresh fruit, dried fruit. 4 types of raw nuts. 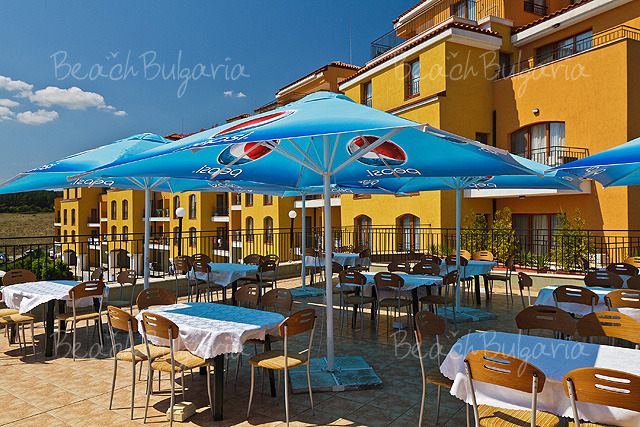 Drinks: three types of juice (machine), soft drinks from Pepsi Cola machine- mix, water, draught beer, draught wine, Bulgarian alcohol /vodka, gin, mastika, mint /. Drinks: juice (machine), soft drinks from Pepsi Cola machine- mix, water, coffee, cappuccino, hot chocolate, chocolate milk, coffee macchiato, herbal tea, fruit tea; Pancakes, finger sandwiches, cupcakes, biscuits, cakes, ice cream. Desserts: cupcakes with honey and jam, halva, cupcakes, wheat ashure, compotes, creams, seasonal fruits. Bulgarian alcohol /rakia, vodka, gin, mastika, mint /. 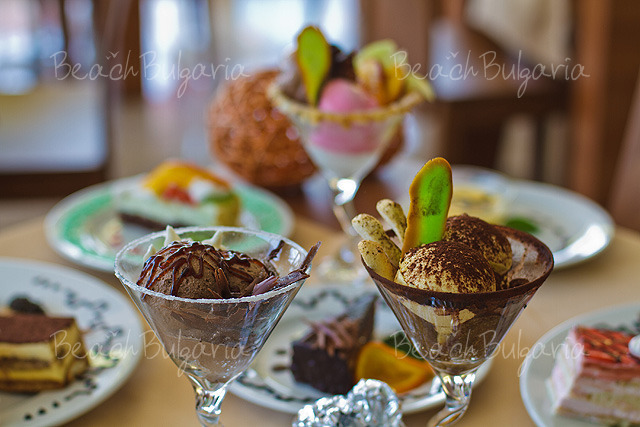 Ice cream-4 types from 10.30 to 21.00 h.
Alcoholic and non-alcoholic drinks are served from 10.30 to 22.30 hours. 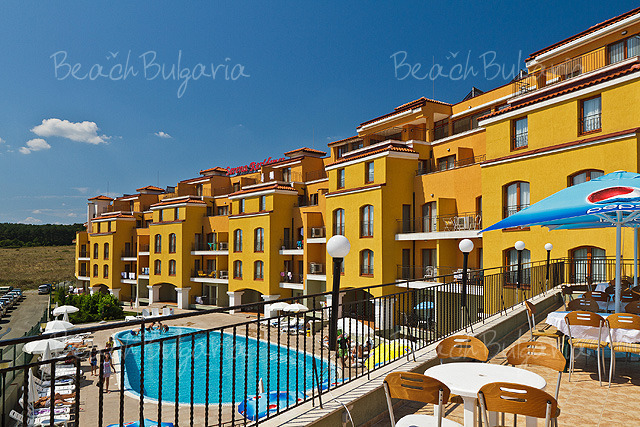 The rates are in Euro per studio/apartment per night, ALL inclusive. 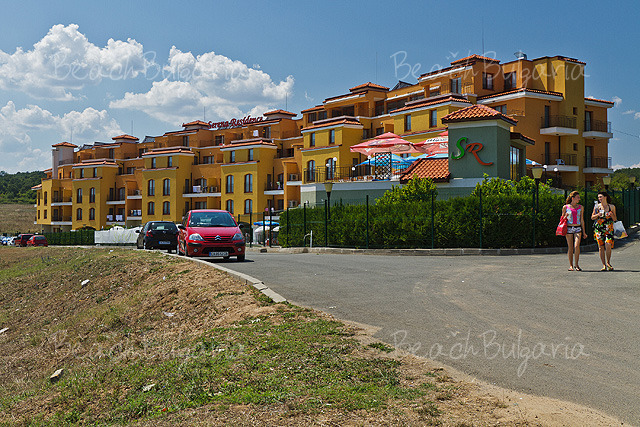 Guests of the hotel could use parking, internet, animation free of charge (15.06-15.09). * Cancellations could be made providing the details of this min. 12 working days before arrival for low season and 14 working days for the period 07 July - 26 August 2019. Cancellations received after these periods will incure penalry for the amount of 2 nights of the total cost from the total cost. 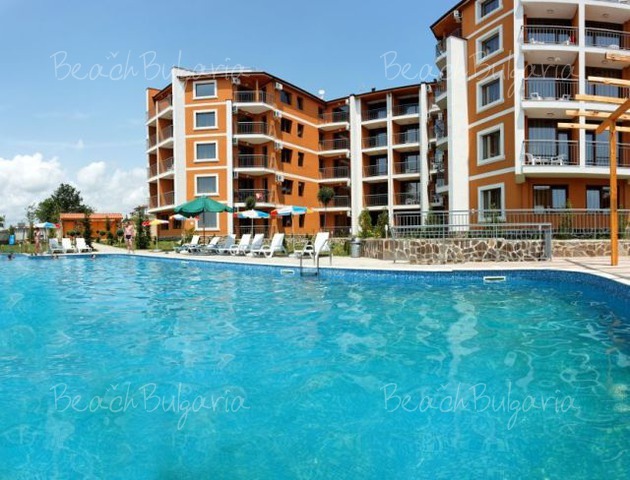 Please, post a comment on Serena Residence Apart Hotel. 7=6 & 14=12 for all booking during 01 May - 16 June 2019 and 09 - 30 Sep 2019!